A year is a short time in science but a lot happened in 2016. In the first of its Summer Series articles, NIWA highlights its top scientific endeavours of the past 12 months and reveals we know a lot more about a whole range of things than we did this time last year. Scientists pinpointed agriculture as the most likely reason for rising methane levels in the atmosphere. Research, led by NIWA atmospheric scientist Dr Hinrich Schaefer, ruled out fossil fuel production as the major cause. The amount of methane in the earth’s atmosphere is estimated to have increased by about 150 per cent since 1750. A plateau was observed between 1999 and 2006 but it then began to rise again. Data indicated the source of the increase was methane produced by bacteria, of which the most likely sources were rice paddies and livestock. It was already known that the methane originated from regions in South East Asia, China and India which are dominated by rice production and agriculture. Methane is an important gas to deal with when it comes to mitigating climate change. Since 1972 NIWA has operated a Clean Air Monitoring Station at Baring Head, near Wellington. The data collected there make significant contribution to the global understanding of greenhouse gases. In June, Baring Head’s carbon dioxide readings officially passed 400 parts per million (ppm), a level last reached more than three million years ago. Baring Head Station. Credit Dave Allen, NIWA. Globally, the 400ppm threshold represents an atmospheric landmark as a focus for the urgency to tackle climate change. The Baring Head reading was particularly significant because most emissions occur in the Northern Hemisphere and the air arriving here originates far to the south, away from human activities. Carbon dioxide is the primary greenhouse gas contributing to warming of the atmosphere and reducing levels to below 400pm would take many years of emissions reduction. Rockhopper Penguins on Campbell Island. Photo taken by David Thompson on 15 January 2004. The remarkable long-distance swimming abilities of penguins were revealed after NIWA scientists tracked 100 birds over winter in the Southern Ocean. No one had previously known where the sub-Antarctic rockhopper and Snares penguins went while they were at sea between April and December each year. It turned out that the penguins travelled more than 15,000km in six months. 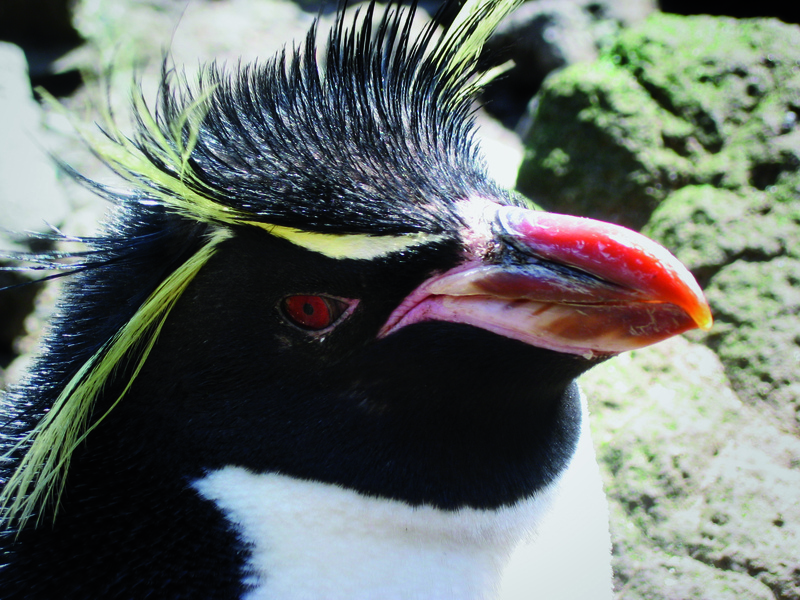 Campbell Island was once the world’s largest breeding colony of rockhoppers,but between 1942 and 1984 the population dropped by about 94 per cent. Scientists have speculated the decline may be due to a change in the penguins’ diet and believe something is going on in the ocean over winter that is causing it. 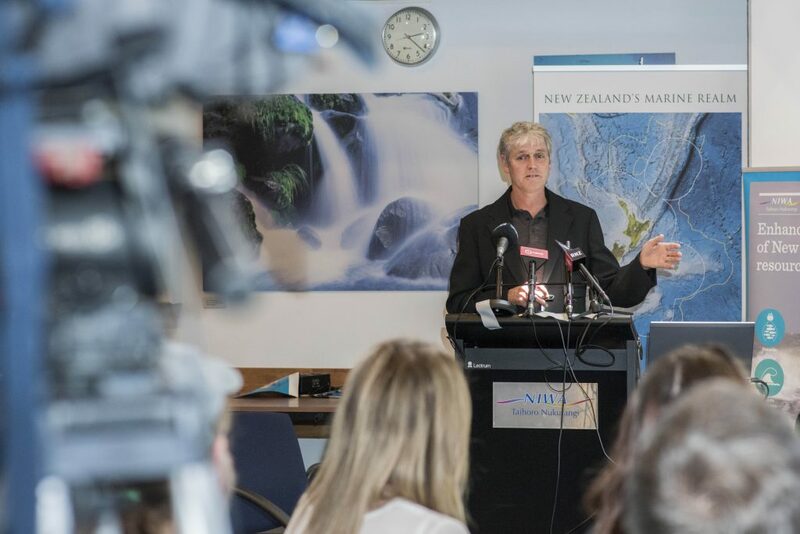 In October, NIWA began a project to find out what lies beneath the waters of the Marlborough Sounds using cutting-edge multi-beam technology which emits a fan of sound beams. In this way NIWA collects a snapshot of the extent and distribution of different habitats on the seafloor. Other technology can also determine the roughness of the seafloor, the amount and size of sediment while data recorded in the water column can used to determine habitats, identify seeps and plumes, detect fish schools and other features. It’s been 70 years since the last survey was done of the Sounds – an area that makes up about 20 per cent of the New Zealand coastline. New features are being revealed that may provide new research ventures for marine science, as well as providing a base for assessing the effects of economic activity. The information will also be used to draw new nautical charts. NIWA marine geologist Dr Phil Barnes speaks to the media. Credit: Dave Allen, NIWA. Several of NIWA’s marine geologists were aboard research vessel Tangaroa researching the Hikurangi subduction zone off the North Island’s East Coast when the mW 7.8 earthquake struck on November 14. Given the expertise on board, and the need to find out how the earthquake had changed the seabed offshore, the vessel was diverted south. Scientists aboard took coring samples and mapped the seabed along the Marlborough coast south to Kaikoura. They discovered new scarps, or breaks, confirming the rupture of the Needles Fault, which is the offshore extension of the Kekrengu Fault. This fault rupture is now believed to extend for about 70km – 36km on land and 34km under the sea. After months of collecting and analysing weather data, NIWA climate scientists were well aware that 2016 was tracking to be the hottest year on record for New Zealand. Summer 2015/16 was particularly warm and then autumn set some new temperature records making it the second warmest autumn on record. Winter followed suit, with a balmy June and July with temperatures above average. It turned out that August ended up being the only month cooler than average month this year. The previous record was set in 1998 but what NIWA scientists say is that the figures are in line with global average temperatures and confirm the longer-term trends of climate change. Globally, 2016 is also set to be the hottest year on record by a significant margin. It will also mean a new high set for the planet for the third year in a row. This story is part of the 2016 NIWA Summer Series, highlighting some of the incredible creatures and science around our beaches, coasts and oceans.